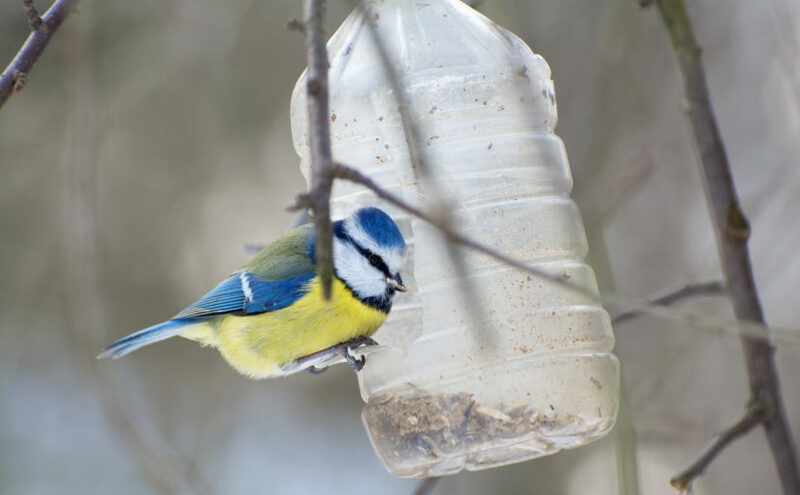 A plastic bottle can easily become a bird feeder for the garden. There are several methods of creating a feeder, depending on your bottle type, the food you want to place in the feeder, and also the birds who visit your garden. However, a popular method is simply to cut a hole out of the side of a bottle, for the birds to access the contents, and hang it in a tree. Another option is to insert sticks or wooden spoons through the bottle, giving the birds somewhere to perch as they feed. Some plants prefer a slow feed instead of being soaked with a whole watering can full of water every couple of days, and an irrigation system is the perfect solution for this. You don’t need to spend lots on this though — simply make your own drip irrigator using a plastic bottle. One method is to suspend an old water bottle above the plant you wish to water, facing the ground, and cutting two small holes in the bottle lid to allow a slow drip. Other methods involve burying the bottle in this position. 2 litre bottles are ideal for making your own plant pots. Simply cut them down to size and decorate however you like. Alternatively, you can make long planters or hanging planters by cutting a large hole down one side of a bottle and using that to plant flowers or herbs in. Make a plastic bottle piggy bank with or for your kids and they’ll love it! What better way to get them to start thinking about reuse and recycling — not to mention saving their pennies. The money can easily be removed via the snout (bottle lid) too when they’ve saved up enough for a treat! A short and wide bottle works best for this project, but any will do. Just add a coin slot, use extra lids for the feet, and get the paints out. Add some cardboard ears for the perfect pig — you could use an old cereal box for this. Your piggy bank doesn’t have to be a pig — it could be any animal you like, an airplane, a train… anything your child loves. Gather a collection of bottles together — ideally the same size as each other — and paint them in a fun design. Add a ball and you have your very own set of skittles to play with at home or in the back garden. Do you have any other plastic bottle reuse ideas? Let us know in the comments below. For more upcycling ideas, try our 25 ways to reuse an empty glass jar blog post.